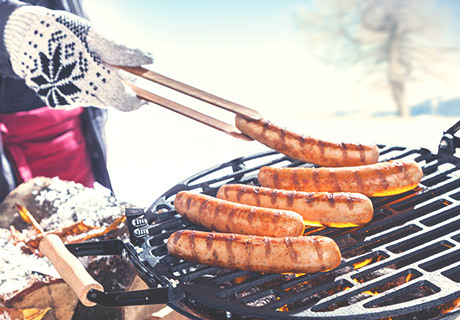 Bring a little sizzle to your home this winter with these cold weather grilling tips. We know that backyard cookouts are traditionally reserved for the summer months. But here at Seven Seas Pools and Spas, we believe grilling is a year-round sport, and with this winter weather, you could probably use a few smells and sounds of summer to warm you up. Although we can’t promise that the weather will be nice enough to eat outside, you can still use your grill to cook delicious and hearty winter meals. Here’s a few tips to help you get started. Wipe down your grill and side shelves, and shovel a path to your grill. If necessary, throw down some salt along the path – slipping on ice with grilled meat is not allowed. Because it gets dark earlier during the winter months, you’ll want to be as prepared as possible before you start cooking. Take some time the night before to prep your foods so that they’re ready for the grill as soon as you get home from work. Place your grill in an area where it is sheltered from cold winds, and far enough away from combustible surfaces so your house doesn’t catch fire (about 10 feet away from any fire-prone surfaces). Before you light the grill, make sure that your scarf is tucked into your jacket and your hat is secure on your head so they don’t dangle or fall into the flames. Also, remember that winter gloves are no replacement for barbecue gloves. Be sure to wear your heat-resistant gloves, even if you have to wear them over your winter gloves. During the summer, it’s easy to cook your meals just by opening the grill lid and checking the food. But during the winter, lifting the lid can cause your grill to lose heat very quickly. Use a timer to set a cooking time and lift the lid of the grill as little as possible. If you’re using a charcoal grill, store your charcoal in a place where it can stay dry. If your charcoal gets wet, it will not catch fire. If you’re using a gas grill, be sure that you have an adequate amount of gas in your tank. The cold can cause your grill to take longer to heat up, which can quickly burn gas. Have you grilled during the winter? What’s your favorite barbecue food? Tell us in a comment below! How Do Hot Tubs Help Alleviate Joint Stiffness & Arthritis?